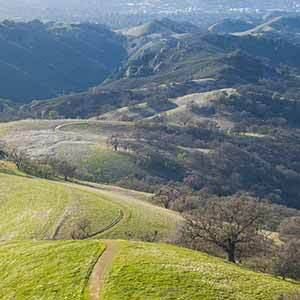 This is the Mount Diablo’s most memorable hike — the complete climb from base to summit. 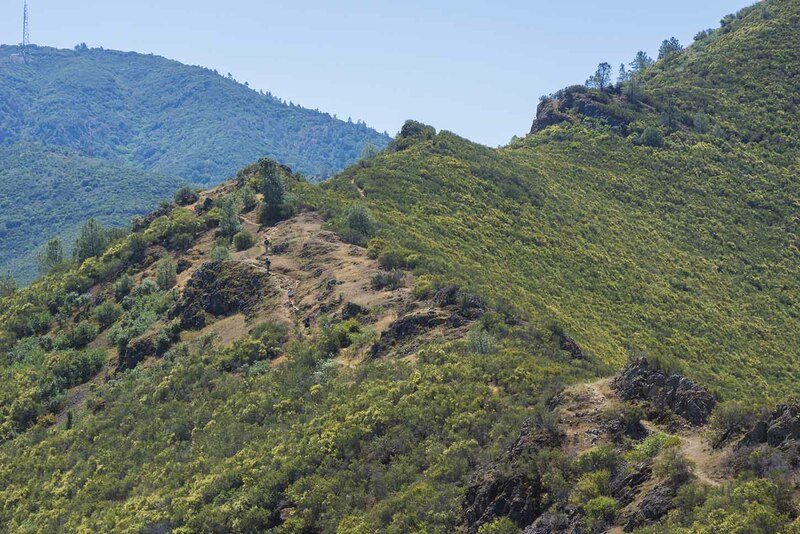 Because of how steep and rough the trail is, it’s much more difficult than other climbs of this length and elevation change, such as Murietta Falls. The entire loop takes me about 8–9 hours; there just isn’t a lot of trail where you can walk at a normal pace. 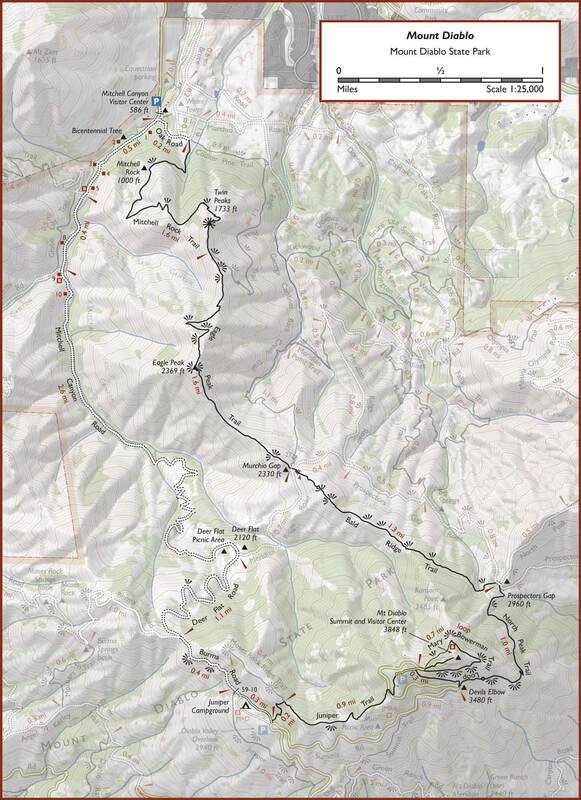 The first half of the route described here, via Eagle Peak and Bald Ridge, is especially slow and difficult due to the poor condition of the singletrack trails. But it’s also by far the most scenic way to the summit. The route is surprisingly popular given how difficult it is — on a nice spring day you might pass a group of hikers every 5 or 10 minutes. 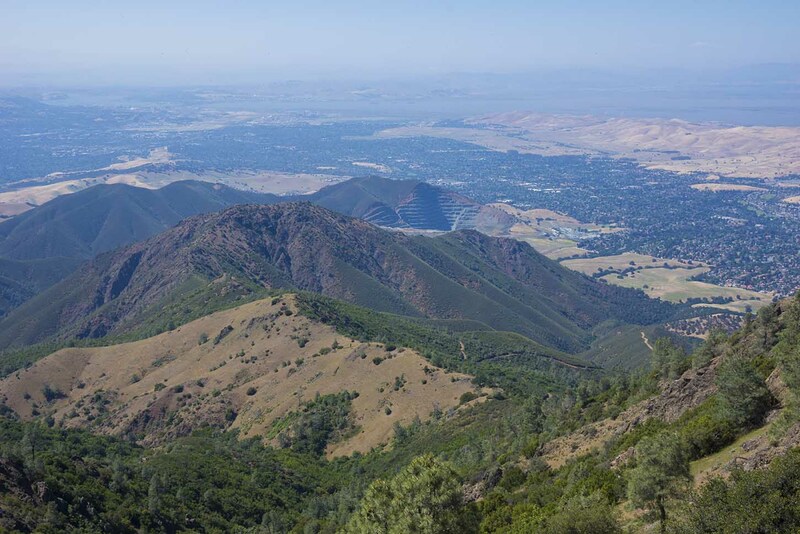 If the entire hike is too much, the loop can be done as two hikes: Mitchell Canyon to Murchio Gap and Diablo Valley Overlook to Murchio Gap. Each of these segments on their own is still really challenging and enjoyable. Another option might be to take dirt roads rather than singletrack trails to the summit; these routes are faster, but they’re much less scenic and they’re still pretty steep and difficult. 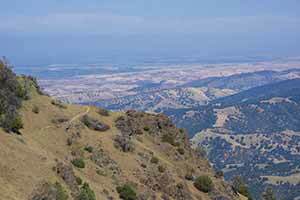 The route to the summit has a lot of striking views of the Bay Area and Central Valley. 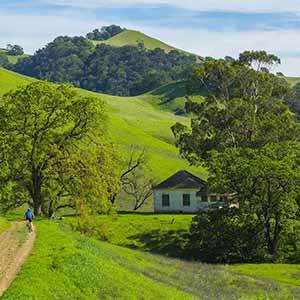 The views are much more dramatic than those from any other trail in the East Bay. 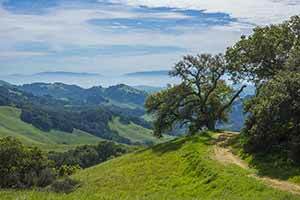 The hike is made even more interesting by the unusual vegetation in this area; the slopes of Mount Diablo, especially the northern slope, really don’t look like any other place in the Bay Area. On cool spring days, when the vegetation is green and the flowers are blooming, it can be quite attractive. Most of the route is exposed to the sun and can get really hot, so I wouldn’t recommend trying this hike if the forecasted high for Clayton is over 85 degrees. 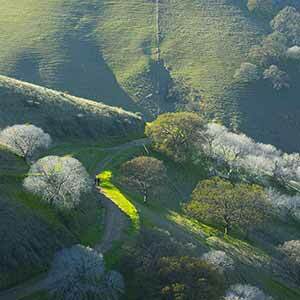 Like everywhere on Mount Diablo, there’s a lot of poison oak along this route, although it can normally be avoided. Hop trees are also common throughout the hike; the leaves of this tree look a lot like poison oak but they don’t cause a rash. Hop tree leavers are usually a little flatter and not lobed, while poison oak normally doesn’t look like a tree in this area. Park at the Mitchell Canyon Visitor Center. The Mitchell Canyon Road trailhead is just to the right of the visitor center. 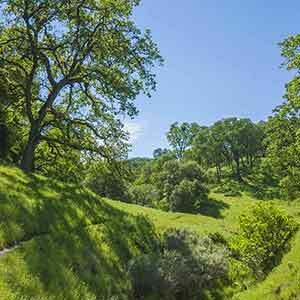 The hike gets off to a great start as the road runs through attractive oak woodland. After just a few yards, turn left onto Oak Road, which sets the tone of the hike by immediately beginning a steep climb. Turn right onto the singletrack Mitchell Rock Trail. 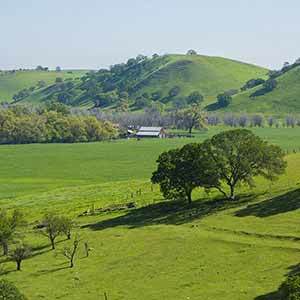 Here, the oak woodland quickly gives way to an unusual landscape of grass-covered hills dotted with Coulter pines. These pines don’t normally grow in the Bay Area; they’re more commonly found in the mountains of Big Sur and Southern California. The trail passes Mitchell Rock, a not-very-exciting lump just to your right. 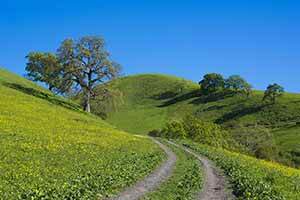 The trail comes to the base of a huge, steep hill; as it starts climbing the hill, the landscape changes to scrub. The next landmark is Twin Peaks, a small rock formation with a great view of the valley to the north. This is where the scenic views start to get really good. Up to this point the trail has been wide and well maintained, but as it begins to climb up a steep ridge to Eagle Peak, it becomes narrow and somewhat rough. In particular, as the trail goes through some large switchbacks, it passes through a narrow tunnel through dense, tall scrub. Although the trail is heavily used, it’s also overgrown enough that you have to crouch down. This is actually pretty typical of Mount Diablo singletrack. At least the chaparral offers some shade, and the effort of pushing through all the brush and trying to avoid the poison oak takes your mind off all the climbing. As the trail approaches Eagle Peak it breaks out of the chaparral, providing the most spectacular views yet. Ahead, though, is a steep 300 foot descent on a narrow, gravelly trail. The rugged north side of the peak is oddly barren, looking more like the Southern California desert than the Bay Area. The trail bottoms out and then climbs a scrub-covered ridge to Murchio Gap; this part of the trail is quite brushy. Murchio Gap is just over halfway up the mountain, with 2040 feet of climbing done and 1760 feet to go. The second half, though, feels a lot more difficult. Continue straight ahead on the Bald Ridge Trail, which climbs steeply along a ridge which is, as the name suggests, blissfully free of brush for the first half-mile. Besides making hiking a lot easier, the lack of tall scrub means that are some great views of Clayton and the surrounding hills. Unfortunately the trail eventually begins a steep climb through a narrow, overgrown tunnel cut through a mixture of tall scrub and groves of small, scrubby trees. There’s a lot of up-and-down and in places the trail is so steep that it’s hard to keep keep from sliding back down the hill. There’s also a lot of poison oak but it’s not too hard to avoid. You could avoid this difficult stretch of singletrack by taking Prospectors Gap Road instead of the Bald Ridge Trail, but the road is really steep and less scenic. Prospectors Gap marks the end of the claustrophobic, overgrown tunnels of scrub; for the rest of the hike, the trails are all blissfully wide and well-maintained. They’re still steep and slow, though. 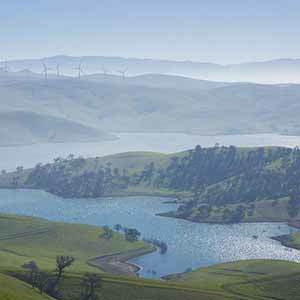 As the North Peak Trail curves around to the north side of the mountain, some outstanding views of Morgan Territory and the Central Valley open up, among the best of the entire hike. 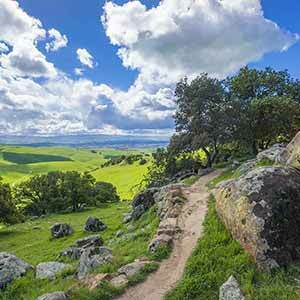 The views are especially dramatic because at this point you’re far above all the other hills around Mount Diablo. After Devil’s Elbow, there’s one last push to the summit area, which is always busy with tourists and cyclists. As an optional victory loop, I like to take the Mary Bowerman Trail around the summit; it’s flat and the views are actually better than the view from the summit. 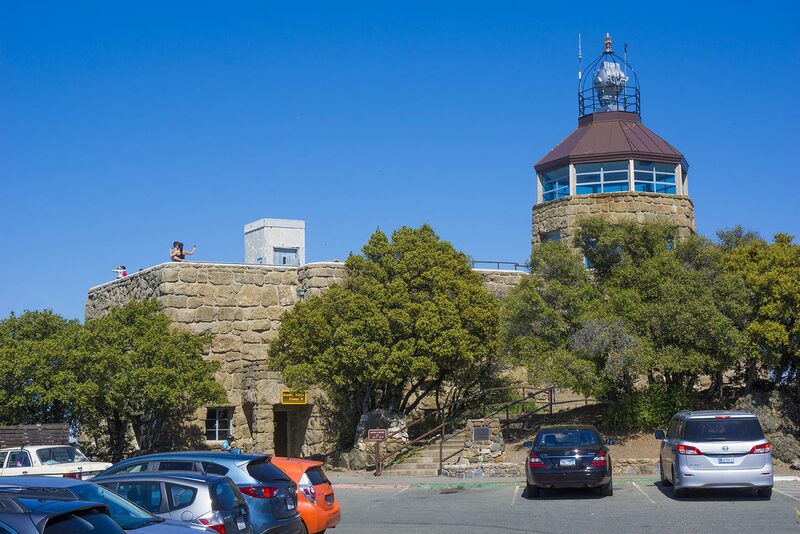 Finally, take the short trail to the summit, where there’s an observation deck and a visitor’s center with a little gift shop. The actual summit is inside the visitor’s center. Because it’s mainly on dirt roads, the descent is less scenic than the ascent, but at least the road is wide and well maintained. You still can’t hike at a normal pace because the roads are steep and gravelly, but it’s faster than returning on the trails would be. The Juniper Trail starts at the end of the large picnic area and overflow parking lot. It descends through a woodland of short scrubby trees, then through a shady bay laurel grove, to Juniper Campground. 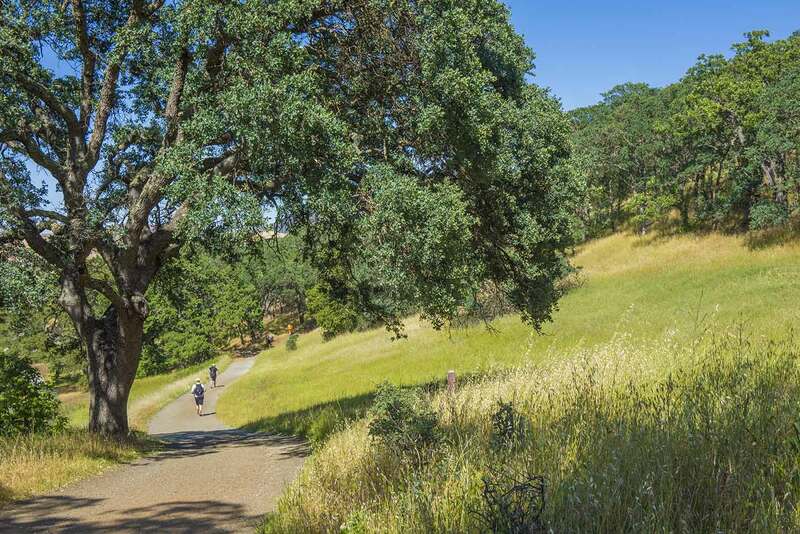 Take the paved road through Juniper Campground to the start of Burma Road, which is one of the few flat stretches on the hike and offers some nice views of the San Ramon Valley. Turn right onto Deer Flat Road, which descends through attractive pine-dotted meadows. The road isn’t especially steep as it zig-zags down the hillside, but it gets steeper and less interesting after it crosses Meridian Ridge Road and turns into Mitchell Canyon Road. The road is clear and in good condition, but it’s slow going because of how steep the grade is. The scenery isn’t anything special at first, but when the trail reaches the bottom of Mitchell Canyon and levels out, the surroundings change from chaparral to a pleasant streamside forest. The scenery continues to get progressively better as the trail approaches the visitor center, changing to mature oak woodlands. Here are a few more photos of this loop. Alice Hikes describes this hike, but in reverse. Everytrail has a similar hike, also in reverse, and taking the easier but much less scenic Back Creek Trail instead of Eagle Peak.